Many thanks to Gina Milne, the super sleuth who writes the great blog Willow Decor. Thanks to Gina's eagle eye, I am happy to report that the darkness is lifting. 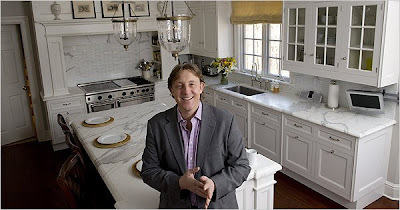 July 7, 2009 -- Greenwich, CT – Christopher Peacock is best known for his cabinetry. For more than 15 years his work has included many private estates and residences throughout the United States, France, Australia, the United Kingdom, Russia, Bermuda, Ireland and Puerto Rico. 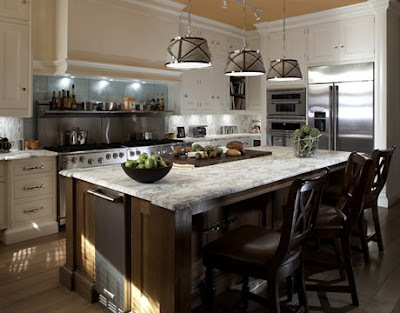 His clientele have come to know Mr. Peacock as the benchmark of quality and exceptional service where all of his cabinetry is produced in the United States. The privately held Corporation had its best year ever in 2008, with gross sales of $20M. Riding on this success, Mr. Peacock successfully sold his company in September 2008 to Smallbone PLC – a publicly traded UK holding company who already owned a collection of high-end luxury brands. These included Smallbone of Devizes, Mark Wilkinson Furniture, Paris Ceramics and Hopton Works. Sadly, the PLC Group, which was primarily based in the United Kingdom, hit hard times due to the global economic collapse. This turn of events provided Mr. Peacock the opportunity to return to his roots and now re-start the brand that bears his name. “I couldn’t be more thrilled to be a part of and lead this dynamic group of designers and craftsman who are all dedicated to excellence once again. We still have so much to offer. In my heart I’m an entrepreneur, and the significant demand for our products and our way of doing business could not be ignored. I felt I had no choice but to continue onward with the brand and the reputation for being the best. By launching a home products collection I will continue to offer well-designed and well built products to designers, architects, builders and consumers alike” said Peacock. The new company plans to introduce many new products for the home, beginning in the kitchen. His MOTRA™ Collection will be the first. This new Collection of high quality, well-designed and affordable cabinetry will be debuted this fall. Under the MOTRA™ label will be a modern line and a traditional line where a typical kitchen from this new Collection will begin at $45,000. “Obviously, the world has changed. To continue to lead our industry we must evolve. Frankly, many lesser brands and mill shops haven’t made it. I believe we are responding to a need in the marketplace and listening to our potential clientele. We are going to be aggressive and fight hard for market share in this multi-billion dollar industry.” said Peacock. In March 2009, Peacock introduced his Contemporary Collection of fitted and free-standing furniture. The Collection includes beautiful new contemporary hardware designed by Mr. Peacock, many new choices of interiors of cabinetry for clients to choose from as well as new wood, stain and paint choices to compliment the new Collection. The new Collection can be seen in several Christopher Peacock Home showrooms in kitchen, dressing room and bath displays. Welcome back Christopher Peacock, the brand and the man. US design needs you desperately. Hello my friend! Been behind on my blog reading. Thanks for the mention. Exciting about CP!! Not nearly as exciting as your new outdoor shower! I think this is thrilling. A lot of folks think to have a Peacock kitchen is way out of their price range. It is a lot less than I thought it would be and the quality is out of site. What is also cool is that he has his own paint line. So, if it isn't in your price range you can still purchase the Cupboard Paint and get the same finish.